Belize Motor Yachts, once an independent luxury boat builder, is now a member of the Riviera group. But unlike the tradition of the car industry they do not build disguised clones of the parent. The latest Belize, the 52 Hardtop, is about as different as it could be from a mainstream Riviera. The styling and interior was the work of a top Italian designer, who aimed for the European retro look and took her styling cues from classic car marques; in particular the 1930s Bentley. To the extent that if you choose a non-white hull the range of colours is straight out of the Bentley catalogue. The style is one thing and actual design another. 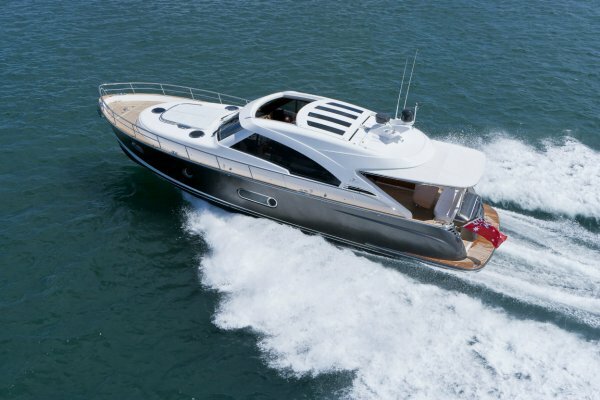 The 52 is a highly practical boat with a great deal of useable space. 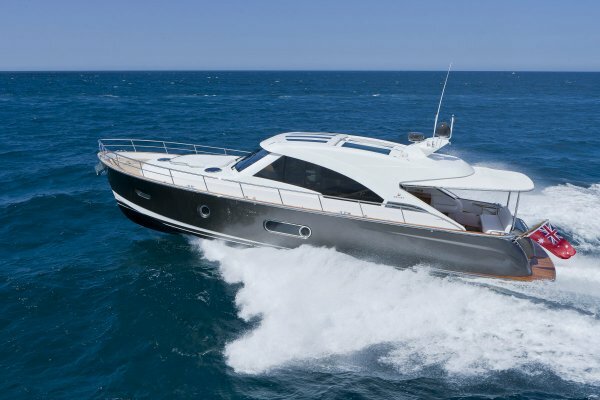 The buyer of WA’s first 52 had originally had a flybridge model in mind, but fell for the hardtop’s appeal and found all the room in it he needed. The Belize fits in three good sized cabins and two bathrooms, a spacious saloon and a very large cockpit, together with a driving area that could double as a secondary social area. The cockpit has the usual amenities – settee, barbecue and so on – the unusual, which includes lockers tailored to take the fenders, and the optional, of which a breakfast bar looks interesting. This would team with the galley, positioned to port just inside the large double doors. A serious galley indeed: granite bench top, two drawer-type fridges, a similar style freezer, a convection microwave, a three-burner induction cooktop, and a bar at the forward end. Aft, a pair of steps each side of an island join the cockpit to the swim platform. This island is the dinghy garage, easily capable of swallowing the 3m RIB. The garage opens electrically, and the section of platform aft of it hydraulically lowers to allow the launching and retrieval of the dinghy. Forward, the cockpit is closely linked to the saloon via the double doors and the lowest of steps, and the whole makes a great party area at anchor. All of the time the saloon works well for a cruising family. The galley is opposite a convertible dinette that would seat five or six plus a couple more on stools. The table is carried on a pedestal of drawers – typical of a theme that emphasizes storage. Like the cockpit the deck is teak laid – far more practical than carpet for a space that gets through traffic. Naturally the electronic entertainment fit out is comprehensive: retracting TV, of course, with blu-ray player, Bose stereo centre with surround sound, iPod dock, and Ericsson W35 marine pack. Below, the theme is space and light. Big windows ensure the latter, and cleverness the former. The master suite for instance is full beam, but only visually so when the big bathroom doors are secured open and the light floods in. The second bathroom has doors from two directions; when open they virtually disappear, the towel rails hidden behind them, and the apparent space multiplies. All three cabins have independent control of the powerful air conditioning, and the two larger have 24-inch TVs. 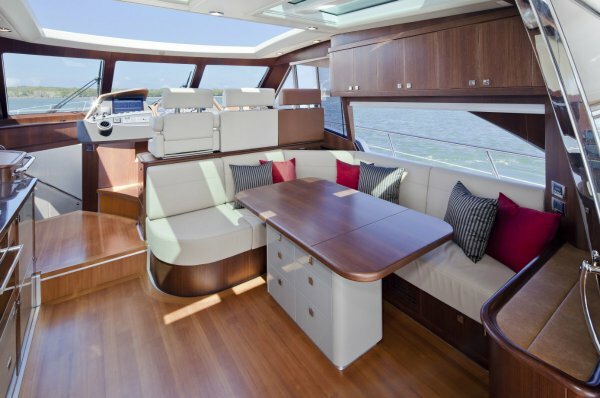 Throughout the boat the designer has matched fabric and leather finishes to the chosen timber: Teak, oak or American walnut. All doors are rubber sealed for quietness in general and rattle prevention at sea. The driving area could almost sell the 52 on its own. Twin seats face a dash the designer excelled herself with. 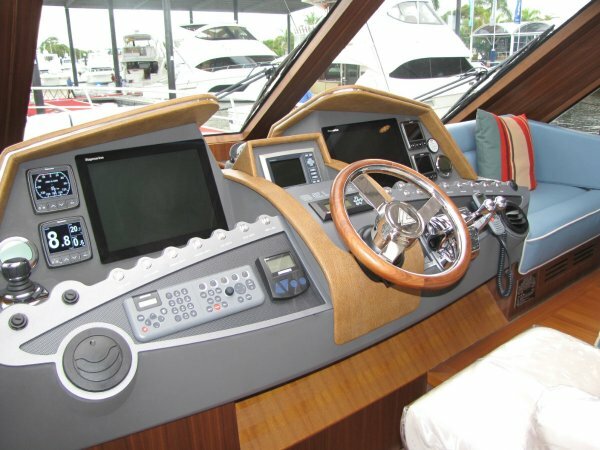 Stunning retro it may be, but it is also a model of efficiency; sculptured surfaces carry switches and gauges logically and house a pair of Raymarine G-Series displays. Here too are the controls for the twin 600hp Cummins diesels, driving through Zeus pods – the system that makes anybody into an ace boat handler. At sea steering and throttle do the same job as on any other boat; when parking, a joy stick moves you forwards, backwards or sideways. Dumbing down? De-skilling? Who cares? 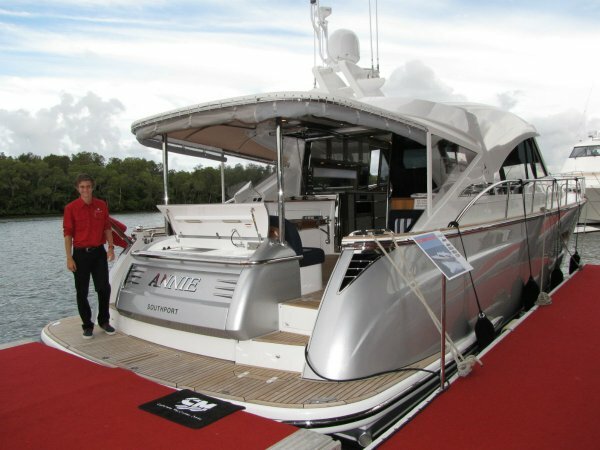 For those who would prefer a 52 with two driving stations, the flybridge version will appear at the Sydney Boat Show.